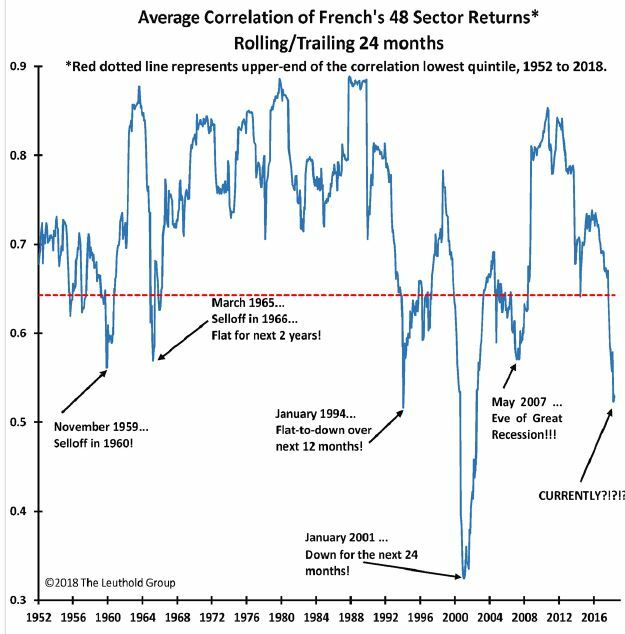 The current market’s low correlation comes as valuations soar. At 22, as measured by the trailing price-to-earnings multiple, valuations are higher than they’ve been 84 percent of the time since 1952. Paulsen said correlation may reflect Fed policy actions, like now. During periods of easy money, liquidity increases and interest rates fall, sending stocks higher across the board. But when the Fed is tightening, liquidity is restricted, yields rise and more stocks are left “impaired,” as correlation declines. For instance, Fed rate hikes might be bad for some sectors, like housing, but good for others, like banking. “Trade wars have played a role,” he also said. Basic materials, industrials and emerging markets have all taken a hit in recent months, but tech has not been as affected, and small caps have been boosted because of their domestic focus.